Is Seymore there? Last name Butts? The Simpsons and Kidrobot are ready to welcome you into the everyone's favorite bar with the Moe's Tavern Mini-Figures! Springfield's favorite bar flies Barney, Lenny, and Moe are joined by everyone's favorites Simpsons characters that even Duffman would be envious of. Collect all 13 today and become the ultimate Al-Collector! Ages 15 and up. 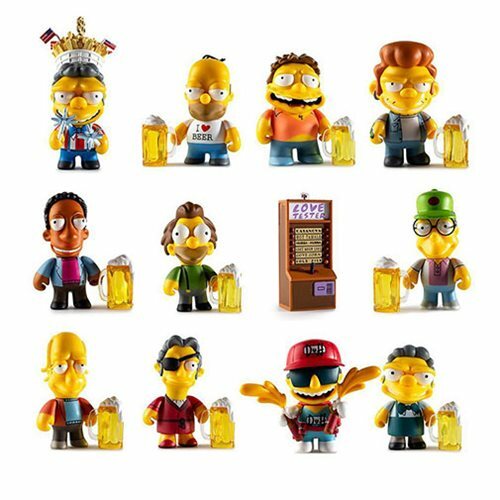 The The Simpsons Moe's Tavern Mini-Figures Display Tray contains 24 randomly selected, individually blind-packaged mini-figures.